Spray sunscreen has been around for approximately the last 10 years after it was created in response to sportsmen on the move and wanting to be able to quickly reapply their sunscreen. Having become increasingly popular amongst many different groups of people since then, as they discovered the convenience of it, a few of the down sides have also made themselves known. The latest downside hit the news rather dramatically when more than one person was badly burnt after catching alight while applying Banana Boat spray sunscreen near a fire. Ultimately, Banana Boat withdrew 23 of their spray brands from the shelves. This involved more than half a million bottles of spay sunscreen, which has to have hurt them big time in revenues, let alone brand image. 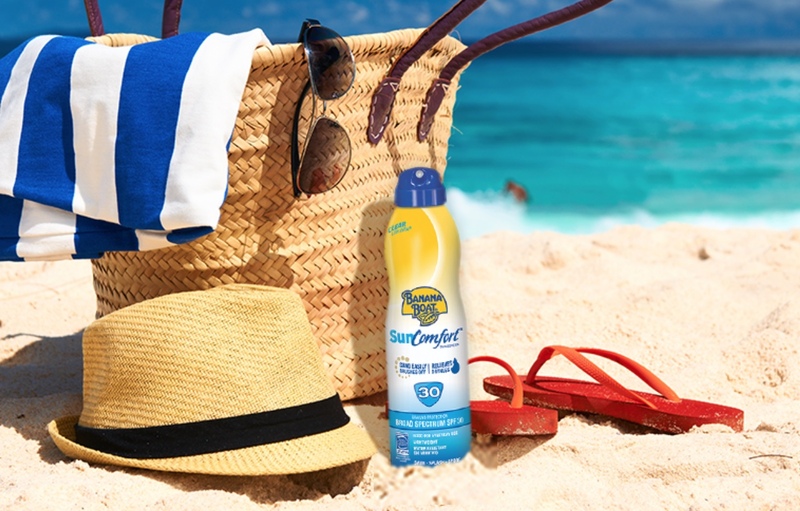 What it has done for the spray sunscreen image at large is another thing entirely. 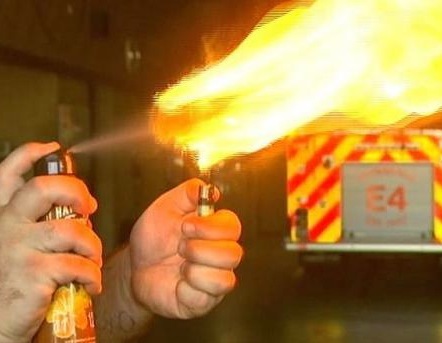 Although there appear to have been only 5 reported situations with one involving a man standing right next to his barbecue grill and another with a woman working with welding equipment, the fact is that those people that have read up about this, are hugely wary of using spray sunscreen again. The information is usually there on the label - flammable, don't use near open flames. Welding equipment and open flames can seem an incomprehensible situation to those aware of the fact that a spray is very possibly flammable. Many people just do not associate a spray sunscreen with 'flammable' due to the core purpose of sunscreens being that of burn prevention! I also believe this showcases the fact that very few people will actually read the label, let alone if an information leaflet is supplied with the product. In Boston, firefighters decided to put spray sunscreen to the test after Brett Sigworth, shown in this video, was badly burned. He said he was using the grill during a party at his lakeside home in Stow, when he decided to apply sunscreen. "I walked over to my grill and took one of the holders to move some of the charcoal briquettes around and all of a sudden it just went up my arm," said Brett. "It went wherever the sunblock went." Photos available will show the severe burns on his chest, ears, and back. You can even see the pattern where Brett says he sprayed the product in streaks across his back. It was a Banana Boat Sport aerosol sunscreen that Brett says caught fire on his skin. "I've never experienced pain like that in my life," he says. Although the product does contain a warning to avoid using while near open flames, it says nothing about once the product is applied. ie. it does not stipulate how long you need to give it to dry after the application. So the fire officials held a lighter and showed just how flammable the products can be when sprayed near an open flame, as shown below. Although you may think this is a little extreme, it nevertheless illustrates the flammability. "We were concerned to hear about Brett's experience," Banana Boat producers said in the statement to CBS Boston. "We take these matters very seriously and will begin a prompt investigation as we continue to strive to deliver products of the highest quality to our consumers." It turns out that the Los Angeles County Fire Department has received calls from similar incidents with use of aerosols containing propellants, or flammable gasses in them. Inspector Quvondo Johnson said that "if it's an open flame, it will ignite whether it's on your skin, whether it's on your clothes, or whether it's in the air". His advice was to heed the label and to perhaps choose lotion sunscreens, especially if you're going to be near an open flame. Many recommendations by the health conscious are to avoid spray sunscreens and rather stay with sunscreen lotions. 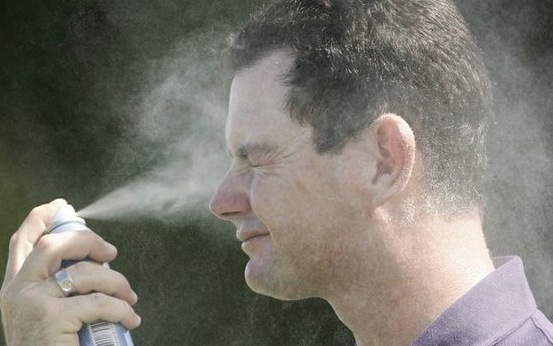 The FDA has said it is exploring further the risks of inhaling spray sunscreens. Those containing chemical sunscreens especially, but more recently the physical sunscreens as many of them are likely to contain nano particles. Advice from most health outlets therefore, is to spray carefully and where small children are concerned, to supervise. One appealing aspect of spray is that they prevent your hands from getting full of lotion, which is very appealing to sportsmen, as well as parents on a beach or such. But dermatologists have pointed out that they scatter too widely and miss the target, plus evaporate before adhering to the skin requiring the protection. Spray sunscreen onto your hands before applying it to your face. The picture above shows a guy spraying most of the sunscreen into the air rather than his face! Use only non-aerosol pumps or stated alcohol free pumps. "My fiance prefers the spray because it's spreads easier on his hairy legs! But I find that so much of the product ends up getting lost in the wind that it's more economical to buy a lotion"
"I agree that the spray seems to waste too much product. I definitely prefer lotion"
"I use a lotion to start with, since I put it on about 15-20 minutes before I head outdoors anyway, but then I pack a spray for reapplication throughout the day"
"I vote for spray all the way. Ever since I've been using spray sunscreen, I haven't had a single sunburn. When I used a lotion, I ALWAYS either miss a spot or don't put on enough. Maybe I've been lucky, but I love how fast it is to apply and how even it goes on."